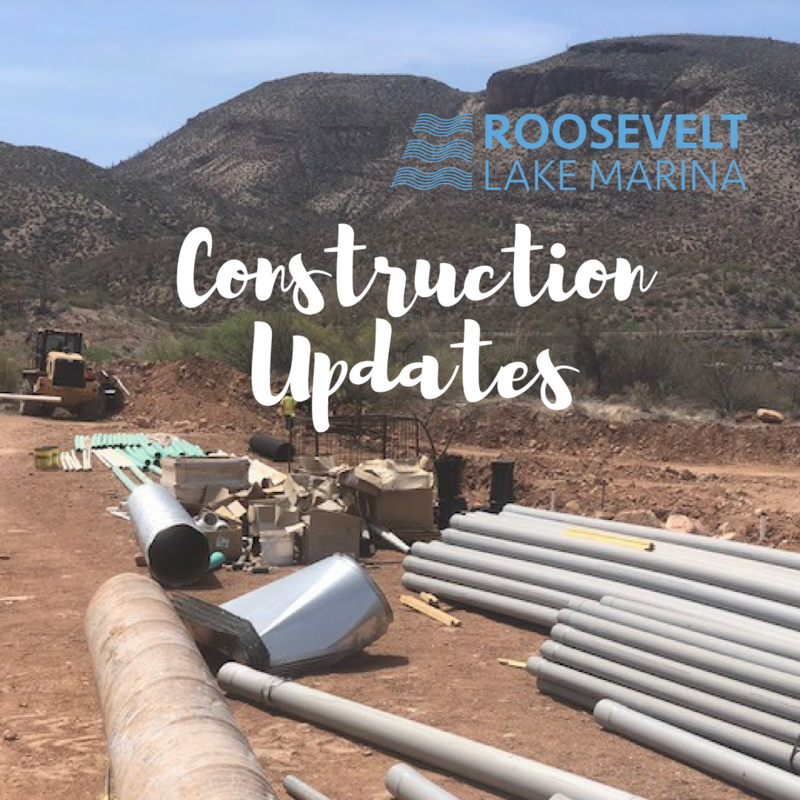 Things continue to progress nicely here at Roosevelt Lake Marina. Guests have been excited to visit and see the progress happening week after week. We wanted to share with you some updates in case you haven’t seen it for yourself yet. The new store has stucco on the outside and the blue roof is almost completely installed. It’s pretty exciting as you can actually see the blue roof when you’re driving to the marina, even before you hit the bridge! We are getting so close on this! The public restrooms are nearing their completion. Tile work has been completed and the inside finishes are nearly done. These should be available very soon for use! Additional Covered Dry Storage units are being erected this week and should be completed by middle of next week. These are already accounted for and we are beginning to collect a waiting list for the 3rd set of available spots, so please let the Marina know if you’d like to reserve/lease a Covered Dry Storage spot in the next round of development. The RV Park site has all been stubbed out and trees planted which gives us a better visual of the spaces that will come to life. There’s been a ton of work behind the scenes with regard to things that ensure that the park will be able to support the treatment plant needs at all levels of traffic including holiday weekends. We are happy with the progress and will keep you posted as to when we can begin taking reservations. Everything is coming along beautifully and we will keep you updated. We hope all construction will be complete by the end of the year!